Rompa Project (論破プロジェクト) is a historical revisionist group supported by Happy Science and led by Mitsuhiko Fujii, who is himself a follower of Happy Science. The group uses manga (comics) as well as panels to spread its messages, and often works closely with Tony Marano and Shunichi Fujiki. 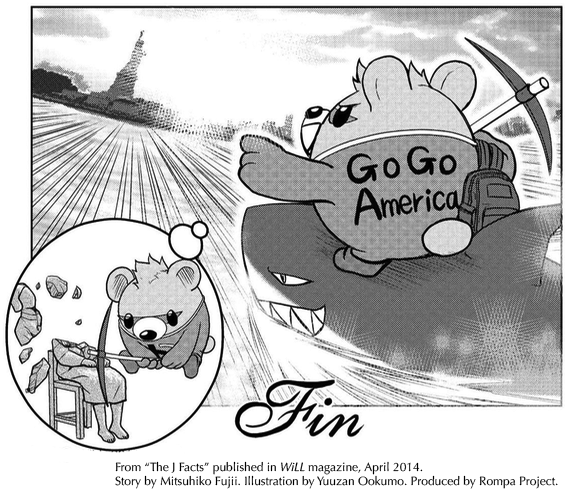 Above: A cut from Rompa Project’s comic, “The J Facts.” The bear character depicted fantasizing about demolishing a memorial for victims of Japanese military comfort women system is Tokkuma, a mascot for the Happiness Realization Party in 2012 and 2013 named after its candidate Tokuma.